Pastor Daniel introduces this episode about being filled with the Holy Spirit as we serve Jesus. We can rely on Him, on His Spirit for our strength. This Leadership Lesson is given by Pastor Jim Gallagher, the lead pastor at Calvary Chapel Vero Beach and also one of the regional directors of Calvary Chapel in South Florida. The phrase “baptism of the Holy Spirit” is used six times in the New Testament, including all four of the gospels. In Matthew 3:11, referring to Jesus, John the Baptist said, He will baptize you with the Holy Spirit. “Everything that happens through the believers in the book of Acts is a byproduct of the baptism of the Holy Spirit.” This baptism is something that is promised to all those who believe in Christ. Jesus spoke of the Holy Spirit being with us, in us, and coming upon us. “Jesus referred to the Spirit in us as being born again. Paul referred to it as the washing of regeneration. The New Testament writers saw the need for the church and the Christian to be continually filled with the Spirit. A few passages with that concept: Romans 15, 2 Corinthians 13; Galatians 3; Ephesians 5; 1 Thessalonians 5. “The work of the Spirit is to lead a person to faith in Christ, to convert that person when they believe on Jesus, to transform a person into the image of Jesus, and to supply continual gifting and empowering as we step out to serve the Lord.” In Luke 11:13 Jesus says that the Father will give the Holy Spirit to anyone who asks Him. He is available to all believers. We are not left on our own. What should a person expect when they are filled with the Spirit? 6 things:1)Sanctification; 2)The presence of God more in daily life, teaching and guiding us; 3)Desire to reach the lost; 4)Fruit of the Spirit; 5)Increased effectiveness in prayer 6)Power of the Spirit (Acts 1:8) We in ministry are completely dependent upon the power of the Spirit to do the work of the heart. “Continually seek God for a fresh work of the Spirit.” In this week’s One Piece of Advice, Pastor John Panico tells us the importance surrendering to Jesus, the source of all things. 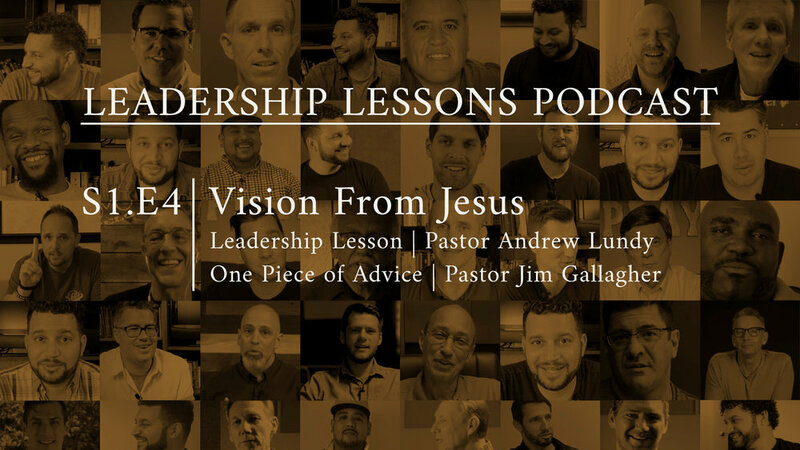 In this episode, Pastor Andrew Lundy, Boca Raton, Florida, talks about vision. How does vision even come about? What does it look like? What do ministry leaders mean when they talk about vision? It is this: “Seeing what God sees—a work of God’s grace. To see what I wouldn’t see otherwise.” In this episode, Andrew explains the pathway—the how—of knowing God’s vision. It starts with Jesus, because God sees all things. The eyes of the Lord are in every place, keeping watch over the evil and the good. (Proverbs 15:3) Vision starts with seeing things from God’s vantage point. God shares the pain of our suffering; He feels it. Then He does something about it. He searches for people to do His work here on earth. For the eyes of the Lord run to and fro throughout the whole earth, to give strong support to those whose heart is blameless[a] toward him. (2 Chronicles 16:9) Then God selects people; He chooses individuals for certain tasks and certain purposes. Jesus chose the 12 disciples. He chooses those who are available for His service. And those He selects, He shows. “He opens our eyes to see what He sees. He gives us a vision of what He sees.” This vision from God planted by God stirs a person’s heart to feel what He feels. He entrusts us with His burdens and develops that stirring into a calling. Then He sends. He takes that burden with a vision and He gives it a mission, a task. This is the thrilling experience of being on that pathway of vision from God through the illuminating work of the Holy Spirit and resulting in praise and glory to God. In this week’s One Piece of Advice, Pastor Jim Gallagher reminds us that it always begins with Jesus.